If you think that most of Google’s products only work online, then you’re probably right.. until now. As of the moment, they’re launching a GMail app, as well as updates to their Calendar and Docs that will maximize productivity even when the user is offline. As told by Google’s Group Product Manager Rajen Sheth, the problem lies that when people need to access their calendar and mail offline, they really have to. 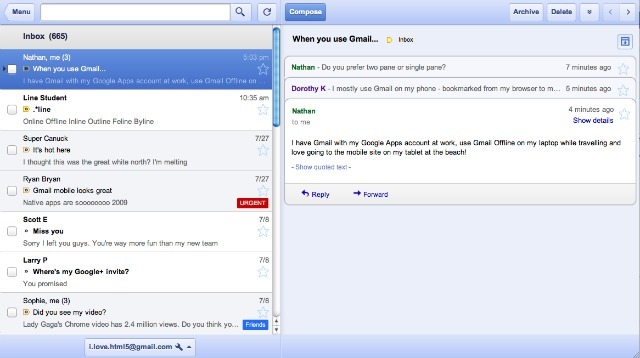 This is why Google is releasing Gmail Offline, a Chrome-based app that’s mainly designed for accessing, managing and sending mail even though you’re offline. This is totally separate from Gmail and is built on HTML5 which has standards that allow the app to work without an internet connection. You’ll probably notice in the screenshot below that the app might look very similar to the tablet version. And that’s perfectly true since this is actually a derivative from the tablet version which is also designed to work with or without internet connection. While it may not be able to do everything since some functions only work with a connection, it will get the job done for the most crucial of your email tasks. Aside from this, Google is also releasing offline versions of their Calendars and Docs. The Calendar and Docs apps will allow users to view their events and documents though editing isn’t integrated yet. This poses a challenge to properly sync offline-edited documents from those in the servers. These apps are available at the Chrome Web Store and an installation of Chrome is needed for the Calendar or Docs offline. But Google will eventually roll out versions of the apps that don’t depend on Chrome.